54 • October 2014 • S I G N & D I G I T A L G R A P H I C S WRAPS DIGITAL GRAPHICS properties such as easy maintenance (anti-graffiti lamination is polyester for example). The manufacturer can fuse laminates to the film layer at the factory, or they can be applied in the shop by a production department—using either a liquid laminate or a solid film laminate with an adhesive layer. Adhesives The adhesive on films will be either solvent or water based. The general con- ception is that a water-based adhesive is not as durable or does not remove as well as solvent-based adhesives, but this is not true. If the quality of the components of water-based adhesives is good then they should perform just as well as solvent based. However, it is very important to remember that water-based adhesives cannot be applied wet. Applying water to the adhesive layer can cause it to whiten or even separate from the film layer which can create snot-like patches (this flat out ruins the film). Adhesive Technologies Air Egress: This refers to ridges or channels that are built into the adhesive layer that allows air to spread out under the film during the installation process. This significantly reduces air bubbles from forming and therefore speeds up the installation process. 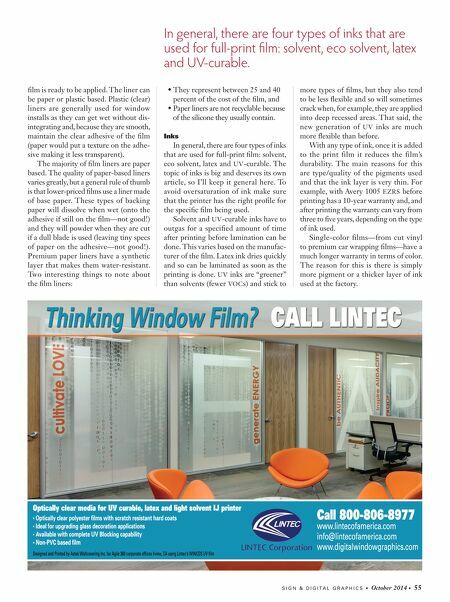 Initially, when this adhesive technol- ogy first came out, it meant that films with air egress had 20 to 30 percent less bonding power than flat adhesives. The reason for this was because a portion of the adhesive layer remained in the channels and not on the surface. Installs became easier (look ma, no bubbles!) but there were more failures on critical areas like compound curves/recessed areas or moisture would get under the film at the edges via the channels. Air egress technology has gotten much better over the years and the per- centage of installs suffering from the loss of adhesive bonding power is in the single digits. This means the quality of installs using air egress films are almost equal to those using flat adhesives in terms of durability, but much more efficient (and less frustrating) to install. Repositionable: This refers to a pro- cess of keeping the adhesive layer away from the application surface immedi- ately upon contact. The technology varies by manufacturer but it mainly involves putting tiny structures—like rectangles or balls—on top of the adhe- sive layer. These tiny objects keep the adhesive from touching the surface, and only when the film is squeegeed does the adhesive layer come into actual contact and adhere. This means that films with reposition- able technology are pressure activated (pressing the squeegee on the film directs the tiny objects into the adhesive, allow- ing the adhesive to contact the surface). The installer must put firm pressure on the squeegee/film while installing to ensure that 100 percent of the adhesive comes in contact with the surface. Film Liner (Backing Paper) PSA graphic films come with a liner that protects the adhesive layer until the Calendered film can work on vehicles, it just takes a different approach than cast. For large scale fleet projects, the lower price point of calendered can make the difference.